Ever since Adele's 21 came out in January, I can not stop playing the album over and over again. From "Rolling in the Deep" to "Someone Like You," it is filled with the prettiest lyrics and piano playing, which to me is the greatest marriage in song. I saw her a few years ago with my mom and some friends when her album, 19 came out. The Script opened for her when they weren't yet blasted on every radio station. I am happy they are finally getting the recognition they deserve, and would be thrilled if they toured with Adele again. It was the perfect collaboration. 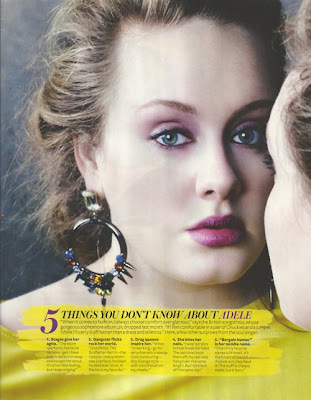 When I received my InStyle magazine in the mail, I was thrilled to see Adele hidden in its pages. 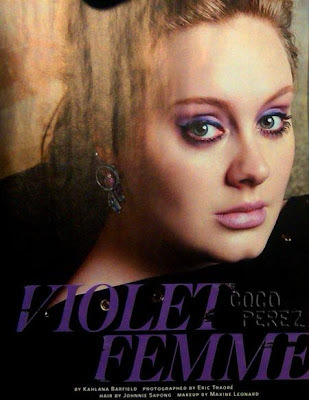 Showing off the season's pretty purple hue, she dawns lilac eye shadows and mauve lips. Nobody could be more perfect to model makeup, with her doe-like eyes and pouty lips. She screams Britain beaut. I definitely read the article, while humming along to "Turning Tables." It seems like the ballad to my life right now. Now I need to snag some pretty purples for my eyelids. I hear they make brown eyes pop!